Level Gauge Manual Float Type - Peabody Engineering & Supply, Inc.
Keep track of your tank levels with our Level Gauge Manual Float Type. All Gemini Float Style Level Gauges have 2” MPT threads or our NEW *¾”/1” MPT, for easy installation into std. Gemini top connections, providing instant level indication on our double walled tanks. Available in your choice of Stainless Steel or PVDF for more aggressive chemical applications. Level listed in 1/8, 1/4, 3/8, 1/2, 5/8, 3/4 and Full in easy to read format. *3/4” gauge comes installed into a 1” x ¾” MPT poly bushing. 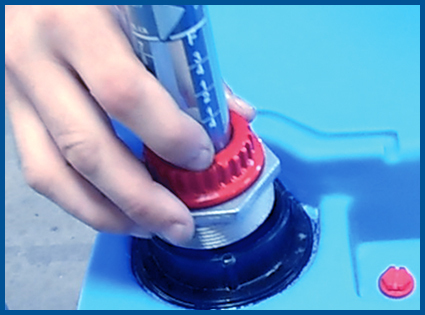 We get a lot of customers asking how to install our Level Gauges into our Gemini Dual Containment® Tanks and our Gemin2 Dual Containment Tanks. Watch this informative Peabody Engineering How To Video and if you still have questions call us at (951) 734-7711. Looking for a Spec Sheet on this? Simply click below for a PDF.